Confession time: we drove this one. It was a really hot day, we were short on time, and we were pretty sure there was no way we´d make 13km in oh, half an hour, as our surrealist tour information officer had suggested. So we drove to the caves and walked around the sites. A good decision. This route is not called the Trail of Three Caves for nothing. 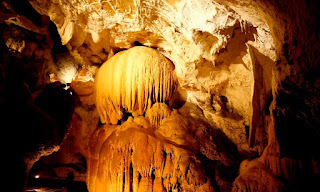 It takes in the caves of Sare (in France), Urdax, and Zugarramurdi (both in Spain). They are each worth visiting for different reasons. All were inhabited at one time or another, and have guided tours available. The Sare Cave tours were fully booked, and since they were in French Tall Guy wasn´t too bothered about missing them. We visited the Zugarramurdi Caves next. It was quite busy. The caves have become well-known thanks to a crazy Spanish movie, The Zugarramurdi Witches, filmed on location. There are some nice walking trails down to the river and through the caves. They are large and quite open, and although the area was quite beautiful, the best part of this tour was watching movie fans check out the site. They were so excited! The Urdax Cave complex was well worth the visit. Stalagmites, Stalactites and an underground river made for an interesting hour. Cave access is by guided tour only, although the explanations are given by a recording of a "cave sprite"... Yeah... Thankfully the natural beauty makes up for the slightly cheesy commentary. It was nice and cool down in the cave, such a relief from the unseasonably hot weather. Baby loved looking around, and though the dramatic rescue of his water bottle from the underground river was hilarious (he tossed it in, it disappeared underground, then reappeared farther along the tour when the river came out again). While it was slightly disappointing not to hike between the three caves (we heard the route was lovely), it was a hot, hot day, and we were glad to have saved time and energy in order to enjoy our cave tours.